Coming soon, the annual Paper Doll Convention, June 22nd to 26. The Silent Auction of original art donated by top paper doll artists is always an exciting high point. Conventioneers write their bid for a specific piece of original art and then keep tabs on competitive bids. Nervous tension fills the air as the hour-long final bidding session takes place after dinner on Saturday. One of the most coveted donations this year is a vintage fashion illustration by legendary artist Jim Howard whose dynamic, yet exquisite style propelled him to the very pinnacle of success. His beautiful drawing is certain to be one of the auction’s big successes. And for those who rely on good luck, Jim has donated a second illustration for the Raffle. That means just one raffle ticketholder will win a magnificent piece of art by Jim Howard. Jim Howard’s Illustrations for the Silent Auction and Raffle. A recently published, splendid book by Stephanie Lake has brought back into the spotlight a neglected designer of the ‘40s, ‘50s and ‘60s whose creative and innovative work was extraordinary. 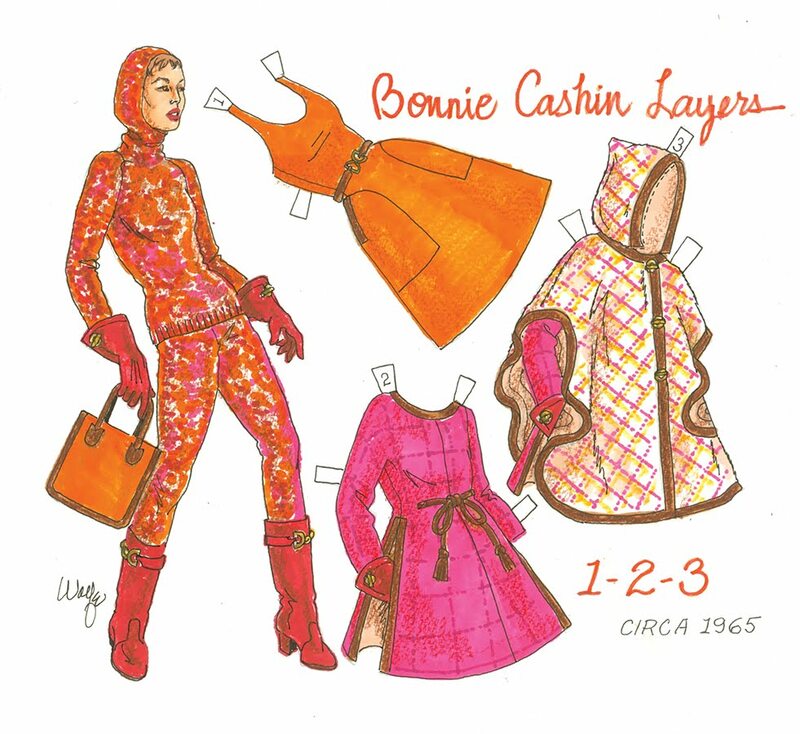 Bonnie Cashin is often credited as the inventor of American sportswear. 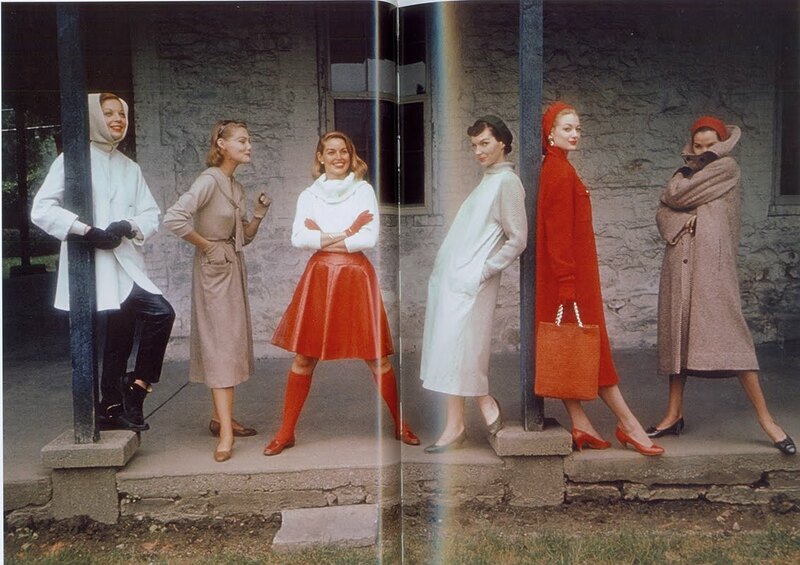 Her fame and success rests on her casually elegant, comfortable yet glamorous designs that were also sensible. Her layered outfits were decades ahead of their time and all of her simple, strong silhouettes stand the test of time. She loved color and texture, favored leather and suede plus some amusing touches like grommets and dog clips. Her accessories, particularly the bags she designed for Coach, made her a household name for decades. 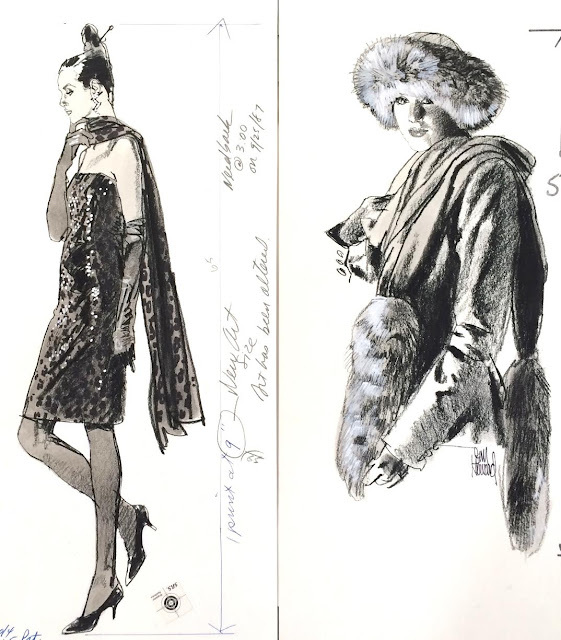 The 286 page book, “Chic is Where You Find It” traces Cashin’s life, philosophy and her dazzling career from Hollywood (including Gene Tierney’s noteworthy wardrobe in “Laura”) to fame on Seventh Avenue. It is $75.00 but obtainable from amazon.com for $45.69. The New Book, Bonnie herself and her famous dog-clip hostess skirt. The current craze for adult coloring books meets fashion with “Fashion Trends: London Look of the ‘60s” by Leigh Rudd. It’s a cute 85 page book illustrated by young artist, Brittany Morganti. 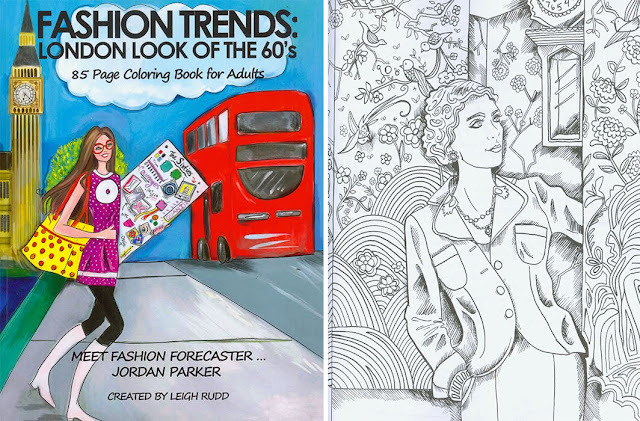 Much more than a coloring book, this tome looks at Swinging London with over 200 images of fashion trends, London boutiques, supermodels, prints and patterns. It’s all fun and surprisingly informative…as seen through the eyes of (slightly fictitious) trend forecaster, Jordan Parker. The author herself is an insider and a very close friend of mine. She just happens to be a famous fashion trend forecaster who initiated the world’s first trend-forecasting company and jumpstarted my own career. The coloring book is $10.95 and available on amazon.com. Vintage fashion forecasting to color for the fun of it. 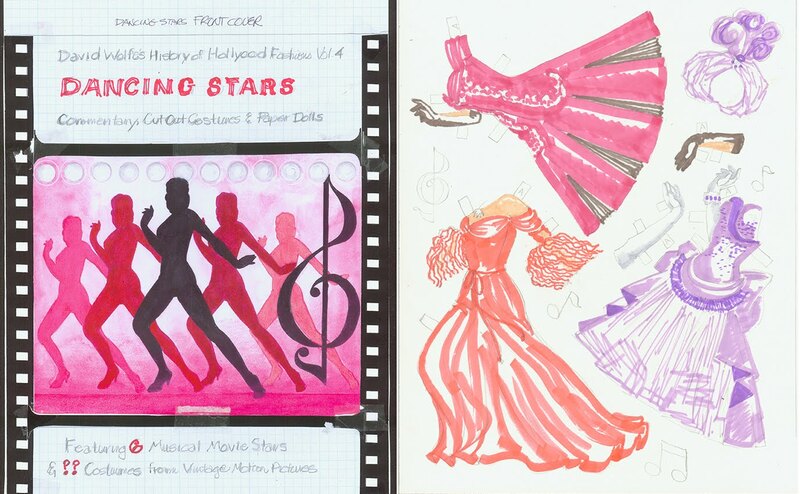 Volumes 3 and 4 of my History of Hollywood Fashions for Paper Studio Press are making progress. Scheduled for publication later this year are “Singings Stars” and “Dancing Stars.” The dolls are finished and what a glamorous group they are! The singers are Judy Garland, Alice Faye, Doris Day, Lena Horne, Shirley Jones and Barbra Streisand. The dancers are Ann Miller, Betty Grable, Rita Hayworth, Eleanor Powell, Cyd Charisse and Leslie Caron. Their on-screen wardrobes include costumes from the greatest musical movies ever made, films such as A Star is Born, Romance on the High Seas, Born to Dance, Cover Girl, Down Argentine Way and Hello, Dolly! Each volume has 10 pages of costumes and I’m now in the process of beginning to colorize the feint pencil drawings with bold swipes of marker color that will then be covered with gouache paint washes and accented with color pencil. All together, I’m working on 72 costumes for the Singing and Dancing Stars. It’s a big job, but I enjoy every minute! Singing Stars Alice, Barbra, Lena, Shirley, Doris and Judy. Dancing Stars Cyd, Eleanor, Leslie, Rita, Ann and Betty. My sketch of the Red Carpet fashion trend at the Met Gala. The greatest fashion show in the industry is the annual fund-raising party at NYC’s Metropolitan Museum of Art. What was once a very sophisticated evening of elegant women beautifully gowned has become a nightmare of vulgarity. It’s a calculated climb up the grand staircase (carpeted in red, ‘natch) to publicize who’s “hot” in the all-powerful media world. The Kardashian clan (klan?) represents the decline and fall of taste that is now epidemic. The fashion news from the evening is flashy metallic (usually silver) creations that only an exhibitionist can flaunt without embarrassment. There is no shortage of wannabe models, actresses and designer’s muses who are quite happy to dress (or un-dress) and pose and pose and pose some more for the photo-op that was once a fashionable society soiree. Jourdan Dunn, Kylie Jenner, Lady Gaga, Kim and Kanye. Joan Smalls, Julia Macklowe, Poppy Delevigne, Rita Ora. I love every task involved in the process of creating a paper doll book. But designing the cover is the absolute peak of imagination and creativity for me. Endeavoring to capture the essence of the cover subject is always a challenge. After all, a paper doll is un-real, a photographic likeness just won’t have the bit of magic that makes those little paper beauties so enchanting. I thoroughly enjoy collaborating with Jenny Taliadoros on the cover concepts, both for my books and for other artists who allow me to envision a cover that captures their individual style. 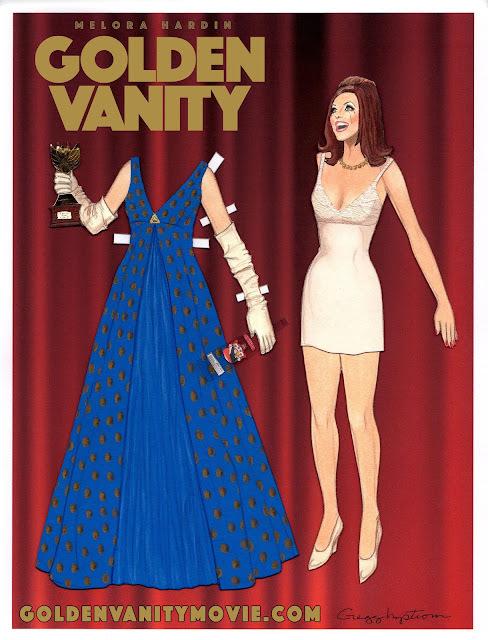 I like a vintage paper doll look and feel for covers, usually working with the standard portrait and doll on the front cover and 2 or three dolls on the back. It often takes more than a dozen rough sketches until I’m happy with a design. The current Hollywood Costume series I am doing for Paper Studio Press has a grid, a film strip I designed that gives the volumes continuity, but allows me space to visually define the book’s content and flavor. 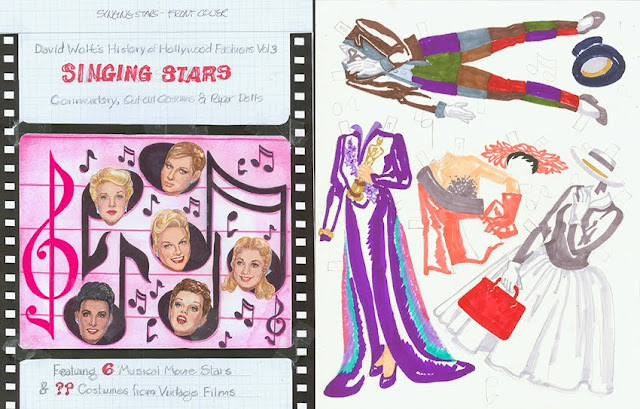 For the Singing Stars, I revisited the old movie motif of faces framed by a star. The Dancing Star cover is not yet finalized, but ideas are stewing in the back of my mind where my imagination is always simmering. 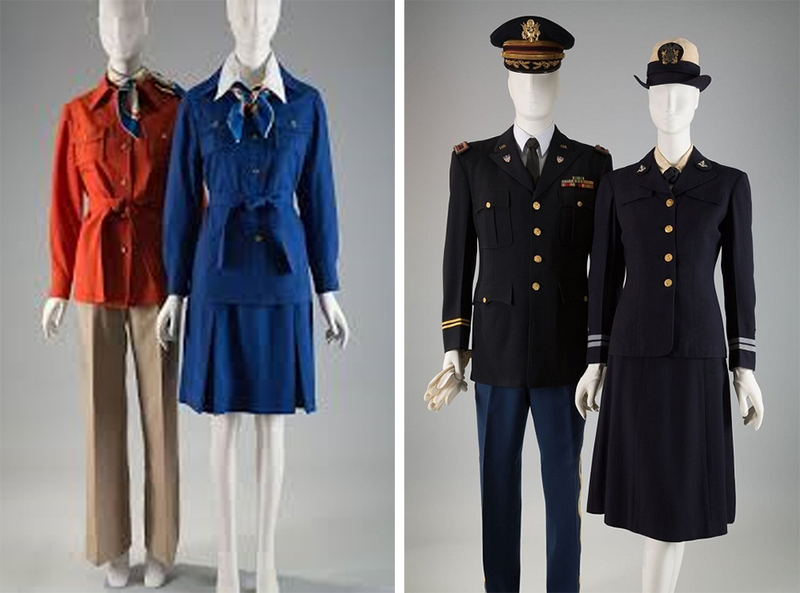 Uniforms may not be considered “fashion” in some circles, but the fascinating new exhibit at the FIT Museum in NYC closes the gap between high fashion and drone workwear. The well-curated selection of uniforms is divided into four categories: Military, Sport, School and work. 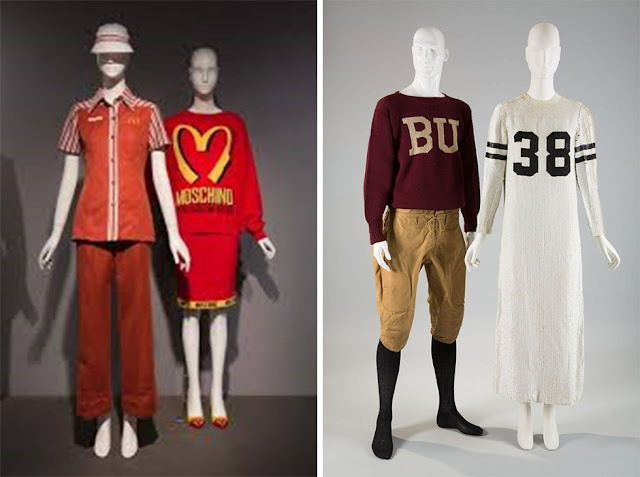 Authentic uniforms, both antique and vintage, are displayed with unique designer creations inspired by apparel made to obliterate individuality. One big group shows how camouflage prints have been totally absorbed by high fashion. The educational exhibition reveals many of the oft-practical sources for traditional uniform details, patterns and colors. School uniform “Blazers” are so-called because of their original blazing red color. “Navy blue” was the color of sea-faring militaries. Breton stripes helped spot sailors who fell overboard. A short film features an interviews with with Stan Herman who designed uniforms for many major corporations including TWA, FedEx and MacDonald’s. This important exhibition of uniformity in fashion will not doubt inspire designers to start a trend for some realistic clothes, for a change. The exhibit at FIT ends November 19th. MacDonald's uniform and a satire by Jeffrey Scott for Moshino. Vintage football uniform and '60s sequin gown by Geoffrey Beene.